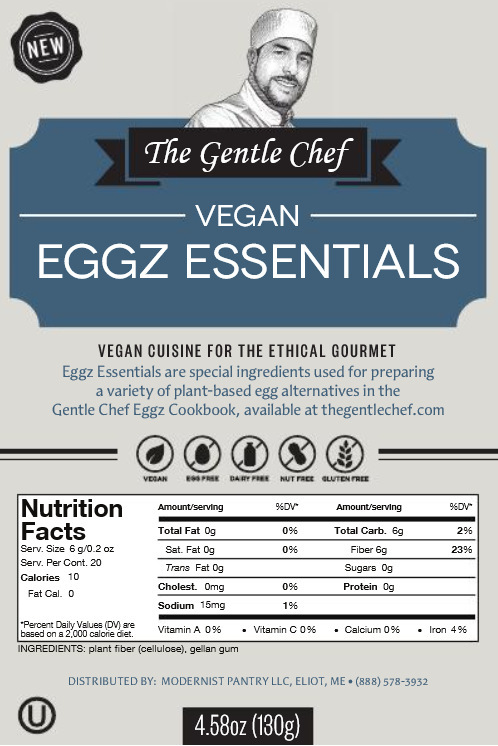 Vegan Eggz Essentials is used in many, but not all, of the recipes in the Vegan Eggz Cookbook to create remarkably realistic simulations of cooked eggs. The product consists of 2 special ingredients, plant fiber (cellulose) and gellan gum, portioned and sealed in their own individual pouches and sold in one convenient package. When mixed with soymilk or almond milk, these two ingredients work synergistically to set the eggz mixtures when cooked. Plant fiber (cellulose) is a non-toxic and non-allergenic dietary fiber (an organic complex carbohydrate and primary structural component of the cell wall of plants and many forms of algae). It is a bulking agent which absorbs large amounts of water. Plant fiber (cellulose) works synergistically with gellan gum as a heat-set gelling agent. Gellan gum is the second ingredient in Vegan Eggz Essentials and works synergistically with the plant fiber (cellulose) in the eggz recipes. It is a water-soluble hydrocolloid (a food gum that forms a gel in the presence of water) produced by fermentation of carbohydrates with the microorganism Sphingomonas elodea (similar to the manner in which xanthan gum is produced by fermentation of carbohydrates with the microorganism Xanthomonas campestris). As a food additive, gellan gum was first approved for food use in Japan (1988). Gellan gum has subsequently been approved for food, non-food, cosmetic and pharmaceutical uses by many other countries such as US, Canada, China, Korea and the European Union etc. In the food industry it is widely used as a thickener, emulsifier, and stabilizer. It has very lubricating properties in cosmetics and pharmaceuticals. Gellan gum is commonly used in commercial soy milks and other plant milks to keep the protein suspended in the milk. It is now the widely accepted alternative to lambda carrageenan in commercial non-dairy milks and other non-dairy foods and vegan food products. It is also used as an alternative to gelatin in the manufacture of vegan varieties of “gum” candies. Unfortunately, as with many food additives, some self-appointed consumer watchdogs and health advocates are declaring this ingredient to be possibly harmful to human health, with side effects including abdominal bloating and other symptoms of digestive distress. However, these symptoms can be caused by even the most wholesome, natural foods and some individuals can be sensitive or allergic to just about any food or food ingredient. This does not imply that the ingredient is harmful to the general public. This same ingredient bashing and fear mongering has occurred with gluten, soy products, plant oils and carrageenan. “Following a 7-day control period, five female and five male volunteers consumed a weight of gellan gum corresponding to 175 mg/kg body weight for 7 days, followed by 200 mg gellan gum per kg body weight for a further 16 days. Measurements before and at the end of the 23-day test period showed that the gellan gum acted as a faecal bulking agent for the male volunteers and for four of the females. Dietary transit time increased for 2 females and 2 males, and decreased for 3 females and 3 males. Faecal bile acid concentrations increased for 4 females and for 4 males; the average increases were from 0.69 to 0.83 mmol/24 h (females) and from 1.22 to 1.44 mmol/24 h (males). Gellan gum ingestion had no significant effect on (a) plasma biochemistry parameters; (b) haematological indices; (c) urinalysis parameters; (d) blood glucose and plasma insulin concentrations; (e) breath hydrogen concentrations. There were no significant changes in HDL cholesterol, triglyceride or phospholipid concentrations. Serum cholesterol concentrations decreased significantly (P less than 0.1) by 13% on average for females, and by 12%, on average, for males. I’ve been consuming gellan gum in rather large amounts over the course of developing the recipes for the Vegan Eggz Cookbook (over 10 months), and I have never experienced a single negative side effect from its consumption. If I felt it was dangerous, I wouldn’t consume it. In fact, like the bulking properties of plant cellulose, I have found it to be very soothing to my digestive system, which would be the complete opposite of alleged reports of digestive distress. The bottom line is that you’ll have to decide for yourself who and what to believe, and weigh the unproven health risks against the culinary benefits of using gellan gum. Only you can determine what’s right and wrong for your body. And don’t just rely on my opinion; do your own research – but keep an open mind. As Daniel Patrick Moynihan once observed, “Everyone is entitled to their own opinions, but they are not entitled to their own facts.” If scientific research provides solid evidence in the future that gellan gum is actually harmful to the general population, I will find an alternative for this ingredient. CP Kelco, the leading manufacturer of gellan gum states that gellan gum is produced by bacterial fermentation of corn syrup. It is not considered “bioengineered food” as defined by the United States Food and Drug Administration’s proposed rule governing such foods. CP Kelco’s products are produced using bacteria that have not been genetically modified as defined in EU Directive 2001/18. No raw materials produced from or by GMO have been used for standardizing the ready-to sell product. Is Gellan Gum Suitable for Vegans?